We’re just two weeks away from opening our doors at our new home at 17 Narragansett Ave. and introducing the gallery at taste – where we’ll feature vignettes of custom furnishings and accessories by taste, finished with local art. Be sure to join us at one of these open house events and meet team taste members and the artists whose work will grace our walls and finish our interior compositions. Evelyn Thistle Rhodes moved to an island in Narragansett Bay in 1976 because it was the most beautiful place she had ever seen. Since then she has been painting the light and shifting colors of the landscape and coast, capturing the rural character and rendering the many moods of nature and the subtle movement of the seasons. Evelyn’s work has been a longstanding favorite at Jamestown Designs for nearly thirty years. 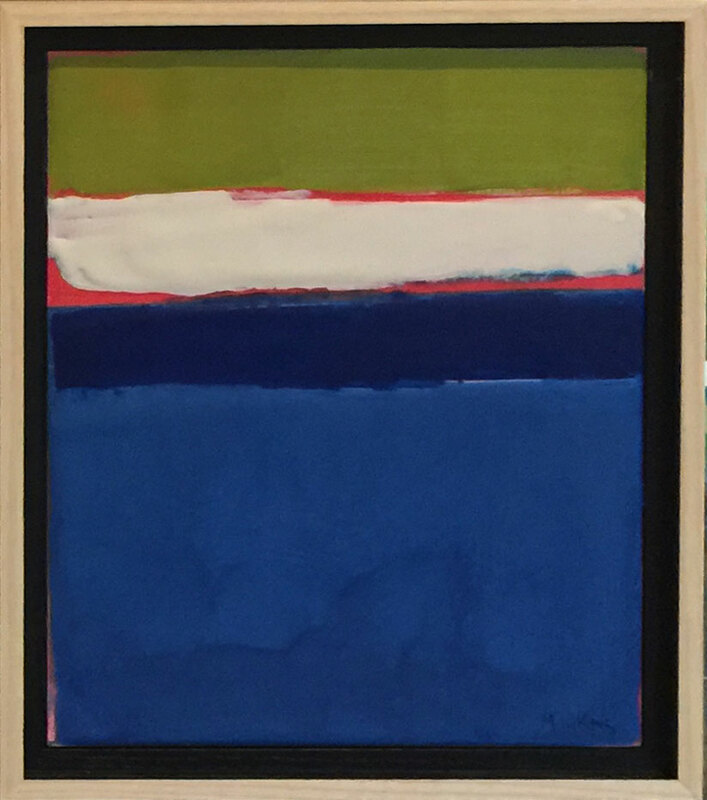 As we take the reins from Debbie Swistak and Carol Andersen, we’re pleased to continue to present Evelyn’s work, yet shift the focus to her abstract works of art juxtaposed with her classic coastal scenes. Equally as exciting is Evelyn’s agreement to reproduce a giclee of her Crow in Snow oil painting – a favorite of mine discovered during a creative session at Evelyn’s studio. The Crow in Snow giclee is an exclusive print available only at taste and I couldn’t be more pleased to share this special piece with clients and friends. Susan Strauss paints directly on site as well as from imagination in her barn studio. Layered, musical and original, her colorful work evokes feelings of discovery. 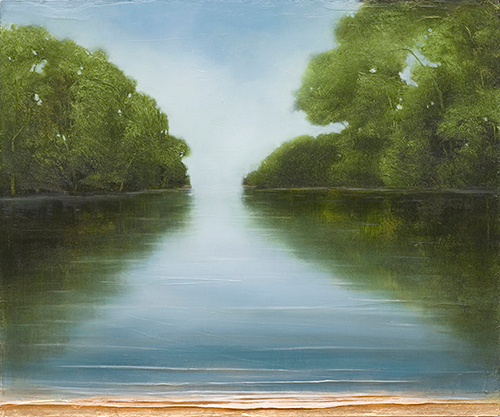 Strauss’s abstract oil paintings are inspired by local land and water, gardening and weather. Her paintings are the perfect finishing touch to a fresh, coastal home. Kelly Milukas is a professional multi-media and multi-faceted artist. There is a playful side of Kelly’s artistic range inspired by her travels, observations and passions. She creates colorful, expressive art in pastel and encaustic that capture the essence of various cultures, animals and still life with big, bold, brave color, shape and texture. Kelly is pure positive energy and her works in encaustic and pastel exude this quality and her limitless curiosities. Barbara Owen is a contemporary painter and mixed media artist. After 12 years in New York she moved to Rhode Island with her family. 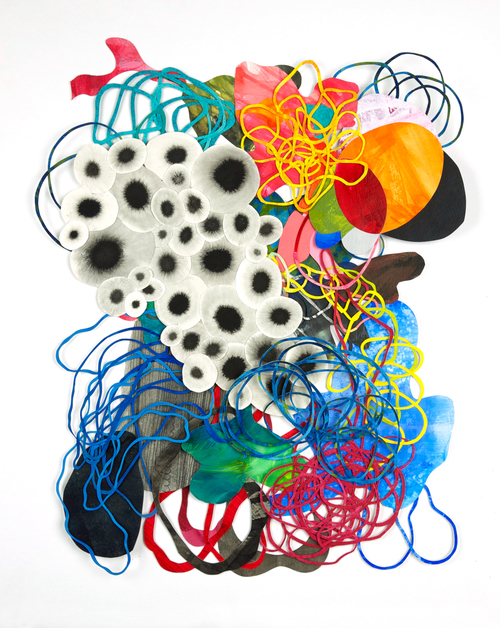 She mainly works out of a studio in Pawtucket but maintains her close ties and studio in Brooklyn, NY. Barbara’s Paper Forms works in cut paper can be thought of as “paintings I have bent or sculptures that depend on the wall”. I’m so pleased to have her work on our walls. Jessica Pisano is Inspired by land & sea. She begins the painting process by documenting what she’s drawn to in nature, either by sketching “en plein air” or using a camera to capture a scenic view. She is interested in the portrayal of time and how atmospheric conditions change the landscape. Jessica strives to create a sense of depth in her work by using the traditional techniques of the Old Masters, applying oil paint in many translucent layers to give the paintings a rich, radiant appearance. As a contrast, she also uses contemporary techniques in which paint is applied in a looser, more experimental and intuitive manner. This combination of art techniques from the past and the present is not just a juxtaposition of style, but also of time. But wait, there’s more… Works of art by New England’s Michael Rich, Peter Roux and Wendyll Brown will also grace our walls. Look for upcoming posts with a sneak peek at their work. Be sure to join us as we celebrate an abundance of local talent! 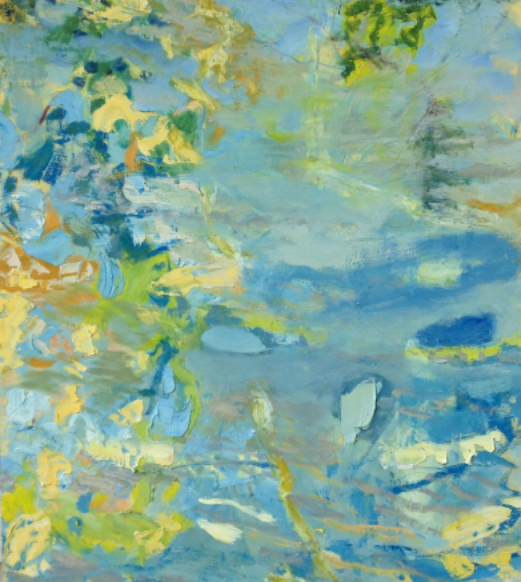 A note to our Rhode Island clients and friends… Be sure to visit the Jamestown Art Center between June 4th and June 27th to explore coastal New England with Rhode Island’s own Dora Atwater Millikin. I’ve remained a big admirer of Dora’s work for years now, and take every opportunity to introduce her to clients. Her paintings grace the walls of taste-designed homes from Newport to Providence. The opening reception will be Thursday, June 4th between 6 – 8pm. Millikin’s work will be on display in the gallery Wednesdays through Saturdays, 10am – 2pm until June 27th. Dora Atwater Millikin grew up in Little Compton, Rhode Island. She graduated with the “Senior Art Prize” from the Stoneleigh-Burnham School, Greenfield, Massachusetts in 1979. Four years later she graduated from Newcomb College (Tulane University in New Orleans, Louisiana) with a BFA Degree in Painting, Drawing, and Art History. In the Fall of 1998, she sought a more structured and academic art program and enrolled as a full time student at the Lyme Academy College of Fine Arts (Old Lyme, Connecticut). She graduated in May of 2002 with a BFA degree in Painting. Today her subject matter focuses on coastal New England scenery with emphasis on the gritty, industrial aspects of the fishing industry and the increasingly more urban nature of local towns. Dora is an artist member and painting teacher at the Providence Art Club. She is currently painting with groups at the Lyme Art Association in Old Lyme, Connecticut and is represented by Walker-Cunningham Fine Art in Boston, Massachusetts. Her work is seen in private collections in Europe and the United States. At the National Arts Club in NYC Dora was the recipient of the Edwin Gould Foundation Award (2002). This award placed her fifth overall for that year. In the Club’s annual student exhibition featuring art schools in NYC and surrounding towns. Upon graduating from the Lyme Academy, she received the John Stobart Fellowship Award encouraging the transition to a professional career in painting. In 2005 she won top honors at the Annual Non- Member’s Exhibition at the Salmagundi Club in NYC with the Joseph Hartley Memorial Award for Oil, in 2007 she was juried into the Catharine Lorillard Wolfe Art Club as an Artist Member, and in 2009 she became an elected artist member of the Copley Society. In January 2010, Dora won top honors at the Fidelity Investments annual juried competition at the Providence Art Club. Dora continues to participate in local and National painting competitions and exhibitions (both solo and group). In 2012 she exhibited 30 paintings in a solo exhibition at the New Bedford Whaling Museum in New Bedford, Massachusetts. At present, she serves on the Board of Directors as an Honorary Member for the South Coast Artists Inc, a volunteer, non-profit corporation that promotes artists year round in the south coast region of Massachusetts and Rhode Island and she opens her studio each summer as a participant on the open studio Art Drive Tour. To read more about Dora and to peruse her gallery of artwork, visit her website at www.wyndfieldstudio.com.